SUBHEAD: Scientists find radioactive plume has spread throughout vast area of Pacific Ocean. 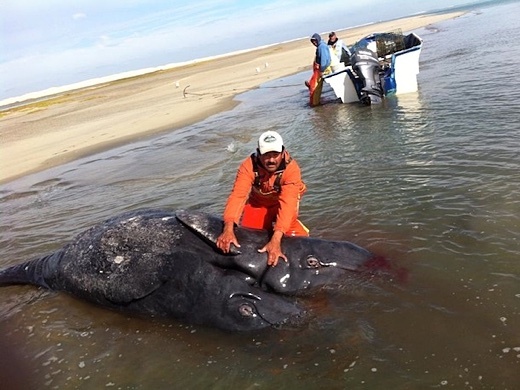 Image above: Miscarried conjoined gray whale calves( thought to be the first ever discovered) found on beach in Laguna Ojo de Liebre in Baja California, Mexico in January 2014. Photo by Jesus Gomez. From (http://www.storyleak.com/scientists-discover-conjoined-gray-whale-calves-dying-near-west-coast/). (emphasis added): UCUT study finds trace amounts of radiation in migratory salmon Columbia River – In early December, a number of news agencies reported seaborne radiation from Japan’s Fukushima Nuclear plant was detected in the Pacific Ocean along on the West Coast. The plant… is feared to still be contaminating the ocean. The impact of the radiation in the Columbia River—and on migratory salmon that spend their developmental years in the Pacific—is still relatively unknown, but recent studies point to causes for concern. Last year, the Okanagan Nation Alliance found Cesium-134, the so-called fingerprint of Fukushima, in sockeye that had migrated up the Okanogan River to British Columbia. Now, a study by Upper Columbia United Tribes has found trace amounts of radiation in Columbia River sockeye as well as Chinook salmon, UCUT biologist Marc Gauthier said Tuesday to the Colville Business Council’s Natural Resource Committee… In the Columbia River salmon, UCUT found… trace amounts of strontium-90, which is another Fukushima radionuclide, according to Gauthier. “There’s some unknowns, some questions that this information raises,” said Gauthier. Fukushima radiation has reached U.S. shores — For the first time, seaborne radiation from Japan’s Fukushima nuclear disaster has been detected on the West Coast… in seawater samples taken from Tillamook Bay and Gold Beach in Oregon, researchers from the Woods Hole Oceanographic Institution are reporting. Because of its short half-life, cesium-134 can only have come from Fukushima. RADIOACTIVE ‘FUKUSHIMA FISH’ WEST COAST USA… RADIOACTIVE fish found off the United States has raised fears the country’s food chain is polluted – and the Fukushima nuclear disaster is being blamed. Highly toxic Cesium-134 – the “fingerprint” of Fukushima – was found in Tillamook Bay and Gold Beach, Oregon. The terrifying discovery was reported by researchers at the Woods Hole Oceanographic Institution… Radiation levels have not yet peaked as a toxic plume makes its way towards the United States. Officials are continuing to monitor the situation, saying the bulk of radiation from the Fukushima plant has not yet made its way across the Pacific. Video above: CBS News broadcast. From (https://youtu.be/Mv2l-oE7nBI).